The Lo-Carbon T-Series Fan range utilises a low energy DC motor, developed to improve performance, lower running costs and maintain T-Series’ rugged reliability. Panel Fitting Kit Lo-Carbon T-Series panel/ceiling models are suitable for mounting at any angle in internal partitions, ceilings, ducts and, with louvre grilles, through external walls. When installed only the louvre grille is visible. With energy saving in mind, Lo-Carbon T-Series models are supplied complete with an integral instantaneous automatic louvre shutter concealed behind the interior grille. With a Lo-Carbon T-Series Controller the fan will operate on both extract and intake, suitable for any angle of mounting. 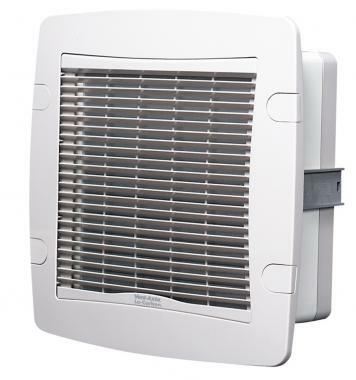 When the fan is used with a Lo-Carbon T-Series controller, the shutter can be set open with the fan motor switched off to provide natural ventilation without the security risk of an open window. Every Lo-Carbon T-Series Wireless FM Controller uses unique digital signals to ensure trouble free operation. The controller will transmit through walls and floors allowing complete flexibility of design to control fans up to 30m away. Suitable for operation in ambient temperatures from -40°C to +50°C. Fitted with self resetting Standard Thermal Overload Protection (S.T.O.P). Lo-Carbon T-Series panel/ceiling models are suitable for mounting at any angle in internal partitions, ceilings, ducts and, with louvre grilles, through external walls. When installed only the louvre grille is visible.